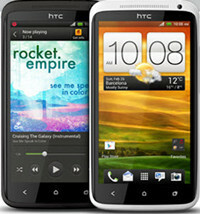 HTC One X was released with HTC One S and HTC One V on February 27, at MWC 2012. It is designed to be with every key feature that you can think of for high-end users. The best HD screen, quad core processors makes the phone run super fast, amazing camera and smart appearance makes HTC One X one of if not the best Smartphone on the market. Any DVD Cloner Platinum is an all-in-one DVD cloner and DVD ripper software for decoding DVD copy protection, clone DVD to DVD, copy DVD on hard drive. What's more, ripping DVD to videos with five different video codec is another important function. HTC One X users could make use of this to rip favorite DVD movies and watch videos on the go without limits and you will be surprised by the perfect output quality with this DVD to HTC One X Ripping software. Want to watch your favorite DVD movies with HTC One X? You can make it just with 4 steps! 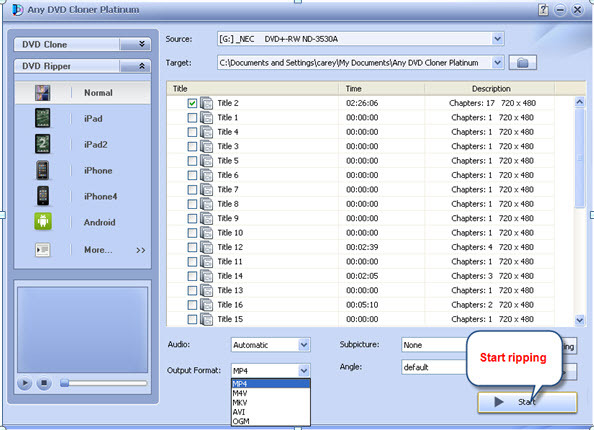 Step 2: Insert DVD to DVD drive and launch DVD to HTC One X Ripper, click "Open DVD" and DVD titles would be listed in the ripper, choose the titles that you need to rip and watch on HTC One X. Step 3: Go to "DVD Ripper" operation panel, choose "Normal". 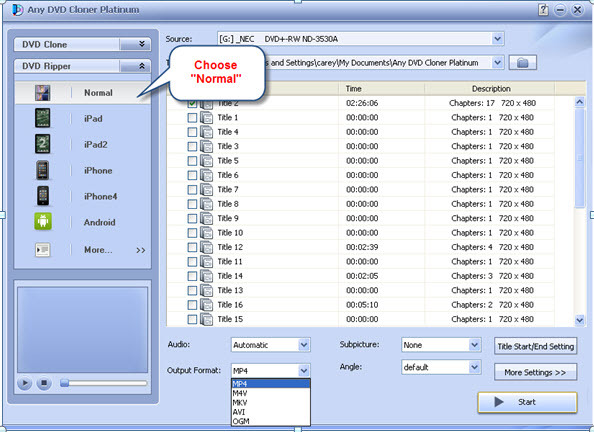 Or you can change "Output Format", choose the one that is supported by HTC One X, such as MP4. Step 4: Click "Start", DVD to HTC One X will start to rip DVD to HTC One X immediately.